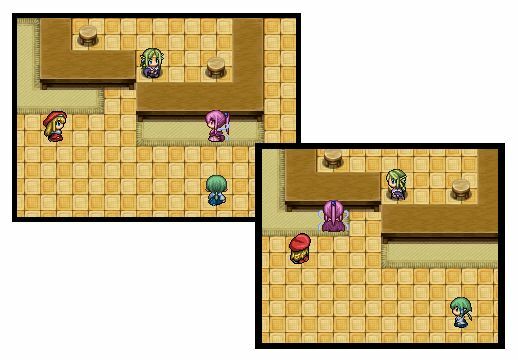 This is the second part of my tutorial on introducing diagonal movement into RPG Maker. In the first part, we started with the default project: 4-directional movement and no support for diagonals movement. 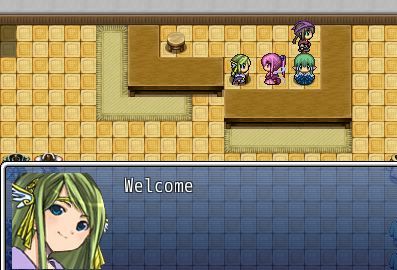 We modified the player input to handle 8-directional input, updated our characters to store diagonal directions, designed a format for our spritesheets to hold the diagonal sprites, and then implemented the new format in our sprite class so that it knows which sprite to draw. If you haven’t read the first part, I would recommend doing so. You can visit it by clicking this link. 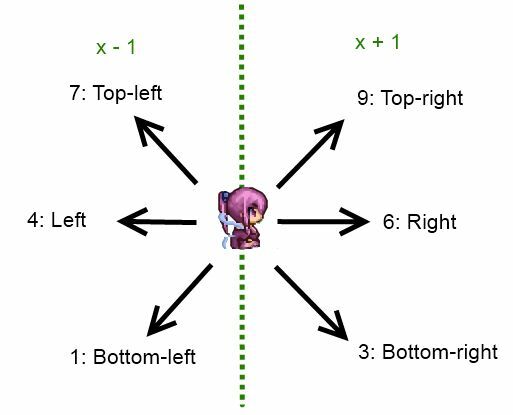 At the end of the article, we had characters that could move in all eight directions using the correct sprite. We then noticed that we couldn’t trigger events if we approached diagonally. In this article, we see why this is happening, and how we can resolve it. Directions play a large part in event triggering. This (kind of) makes sense: you usually check things that are in front of you or under you, rather than behind you or beside you. Well you could of course, but the “Action Trigger” in RM only supports in front or below. 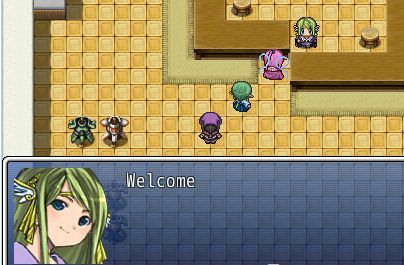 We begin with the player trigger other events by pressing the action button. Currently, our diagonal movement script has no problem with checking for events under you. This is because it does not use a character’s direction property. Check the tile in front of you. Hopefully it is clear what it means for a tile to be in front of you. You can ignore the rounding for now. That is just to take into consideration the possibility that your map loops. If you look at how x_with_direction is defined, you see that it simply adds 1 or subtracts 1 depending on the direction you’re facing. Notice also that it only checks two directions: left or right. It doesn’t consider the possibility that you’re looking towards the upper-left, upper-right, bottom-left, or bottom-right. So when d is 3, 6, or 9, we need to increase x by 1, and when d is 7, 4, or 1, we need to decrease by 1. A similar argument is made for the vertical direction: when d is 7, 8, or 9, then we need to increase y by 1. When d is 1, 2, or 3, we need to decrease y by 1. Note that I do the same with the non-rounded versions for consistency. For some, this might seem a bit strange, but all I’ve done is converted the observations explained above into formulas. You could conditional branches to check each case one at a time, but because there are only 8 directions, we can throw some math at it. Add this to your script, and you should be able to trigger events diagonally now! When you trigger an event, by default it will turn towards you if the direction is not locked. From Game_Event, there is the start method. From there, it calls the lock method. Which is simple enough: it turns towards a character, which happens to be the player. It should be apparent why the event wasn’t turning towards us diagonally. It only turns in 4 directions, none of which are diagonal! The turn_towards_character is meant for one character to turn towards another character in the general direction. 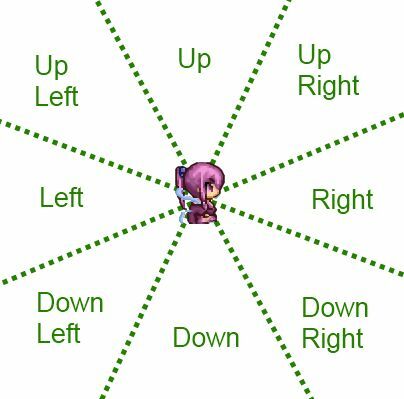 This means that if you’re right beside the character, it’ll turn towards you correctly, but if you’re slightly further away, it will just look in your general direction. So if you’re anywhere inside those regions, that’s the direction the character will turn. If you’re exactly on the edge, it’ll take the region above that line. Each region gets 90 degrees of the circle, rotated 45 degrees along the x-axis. Each region covers 45 degrees, rotated 22.5 degrees to reflect where the target character could be. 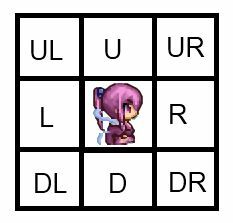 Because we are using a grid, and all of our distance calculations are based on grid coordinates, it would be a little difficult to accurately determine which direction the character should turn. At the very least, we should be able to handle the base case: when the characters are beside each other. At this point, you may want to look at how distance between two characters is calculated since who the point of reference is would affect your calculations. I look at the problem by first breaking it down into two triangles: the upper-right triangle and the lower-left triangle. Which doesn’t look too bad. But as I mentioned, the diagonal regions could be done better. And of course, now when you interact with an event, it will turn towards you properly. There’s an analogous method, turn_away_from_character, which would also need to be updated. It’s basically just the opposite directions since instead of turning towards, you’re turning away. Action triggered events now function correctly, but if you tried to walk up to a touch-triggered event diagonally, it won’t activate. However, if you walk up to it orthogonally, it works! Looking at the two definitions, when you move_straight, it actually performs a check to see if there are any touch-triggered events in front of you, whereas when you move diagonally, no such check occurs. This is possibly because there is no concept of “in front” when you’re moving diagonally in the default engine. 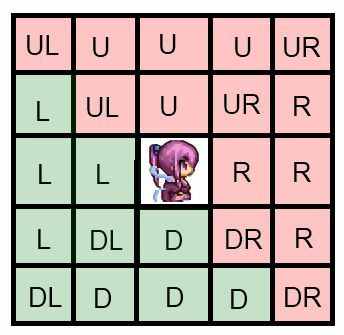 Now that we have an actual definition for what it means for a tile to be in front of you even if you’re moving diagonally, we can simply add the check of the move_diagonal method as well. Note that we should only check if we couldn’t move, because that indicates something is blocking our way. At this point it might be better to simply overwrite the method. 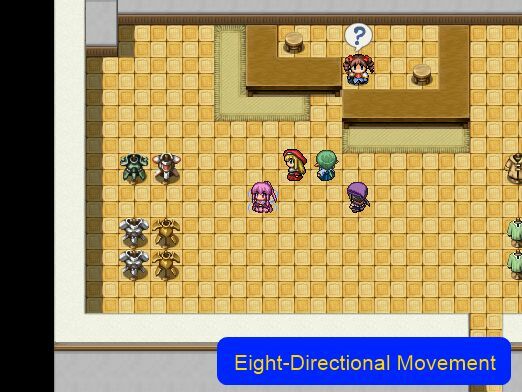 This should cover most of the diagonal movement related issues, and you can now have eight directional movement in your game. Excellent items from you, man. I’ve understand your stuff prior to and you are simply too wonderful. I actually like what you’ve bought here, really like what you’re saying and the best way wherein you are saying it. the right of me, and have an object blocking my upward movement and an object blocking my sideways movement. 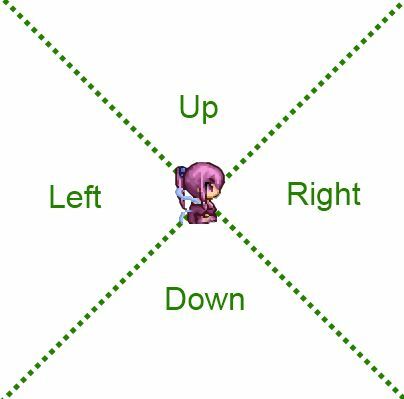 When the character is blocked, they can’t actually turn diagonal — they can only move diagonally, not explicitly turn diagonally. However, this can be achieved with a turn-in-place D8 script.